The world needs the tech sector to take a bigger picture approach. Our work in cloud computing needs to include ethics, environmental awareness and other social responsibilities as part of the picture, too. This week, CS popped up in a Forbes magazine story called “Is Cloud Good for Humans?” The author, Udi Nachmany, referenced the work of not one but two different Container Solutions folk in his wide-ranging article about the emergence of personal ethics in cloud computing. This is really exciting for us, and not just because it’s fun to be in the spotlight. You see, Container Solutions is known for our “big picture” perspective when it comes to helping companies go Cloud Native, fitting together complex tech with each organisation’s unique context and culture to create smooth and successful cloud migrations. But we also work hard to keep an even bigger picture at the top of our priorities list, though: how the work we do fits into, and affects, the wider world. That great big world outside the tech sector, and the people that inhabit it. Recognizing that what we do — those of us in technology, what we all do, every day — ripples inevitably outward, and that the decisions we make have consequences we need to be aware of. For us, this means placing everyday emphasis on wide angle values such as ethics and the environment as core components of our own internal culture. Which is why CS has an in-house psychologist, Andrea Dobson, to help CS staff create proper perspective on why people make the choices they do — and how this affects ethics in the workplace. And how these ethics then redound to the products or services we produce in sometimes surprising ways. 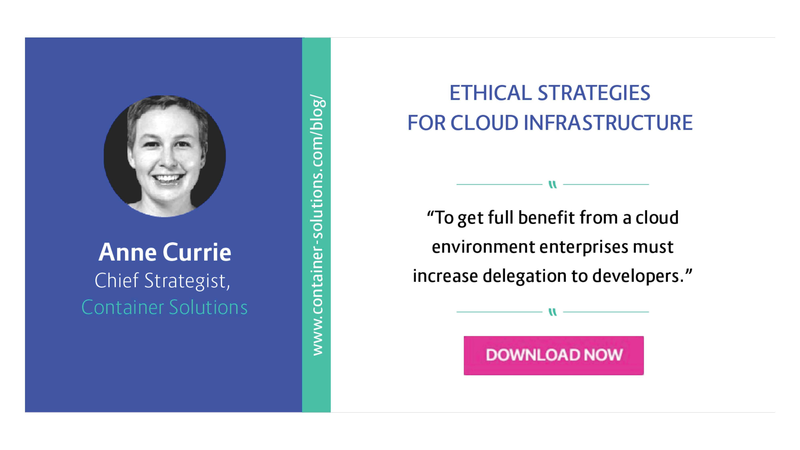 It is also why CS Chief Strategist Anne Currie recently launched a public effort to get Cloud users to help fight climate change. Anne has been writing and speaking at conferences like Velocity about how the over-consumption of dirty energy in data centers is one of the biggest ethical issues facing the tech industry today. Her key message is how easily we can make a truly enormous difference simply by choosing cloud providers who are committed to using renewable and sustainable power, and pushing current providers to switch over. There is much more to be said on both of these very important topics, and say it we will in future blog posts. For now, though, we just wanted to appreciate Forbes for amplifying Anne and Andrea’s significant endeavors. And also take a moment to bask in the fact that people are recognizing our efforts, that Container Solutions values are indeed making themselves heard and felt in the greater world. Ultimately, these collective efforts are fruit born from CS’s roots as a scrappy start up in a field so new that, in 2014, it barely had a name. Launching a Cloud Native consultancy meant being willing to take risks, to be experimental and — most of all — pay attention to outcomes both large and small. Using the workplace as a platform for social change is a potent form of activism that CS co-founder Jamie Dobson recognized early on.